Along the way he has met some incredible people and shared some heartwarming moments as everyday Aussies donated whatever they could to his cause. Now Kevin has been featured in a number of news stories, which showcase the incredible journey he has undertaken, both physically and mentally. Photo: Kevin (right) with riding buddy Cam McKay who joined Kevin for 4 days in support of his mother, who also has PD. 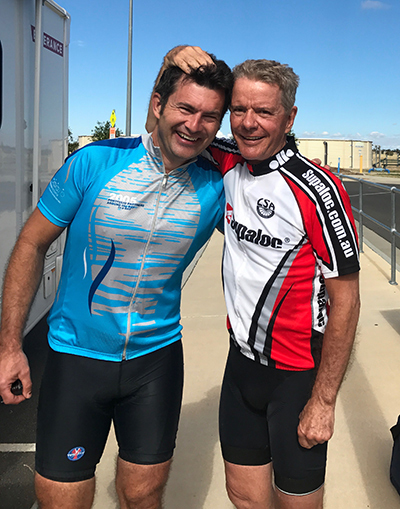 Kevin was also joined by Today Tonight’s Rodney Lohse for the last 3 days of his ride, who documented his emotional arrival at the Rockhampton finish line. Here’s what Rodney had to say about his time riding with Kevin. “Like every good journalist, today I parachuted in to ride on the coat tails of a man I met two years ago. Kevin kindly refers to me as a cyclist, but really I’m a bloke with a bicycle, so I was a bit worried I wouldn’t be able to keep up with Kevin. So this morning in the dark and cold I got to share a small part of Kevin’s incredible journey. He is so close to the end of the trip, that even he admits was crazy, and even young men wouldn’t consider attempting. Kevin has taught me so much about life in such a short time and I will try to express some of those lessons in the story I put together for Channel 7 with my cameraman and editor Andrew Currie. You can view the full Today Tonight story here.